This design hotel offers spacious accommodation, free Wi-Fi internet, on-site parking and a small spa area. It lies in Hamburg's Altona district, a 3-minute walk from Holstenstrasse S-Bahn Train Station. 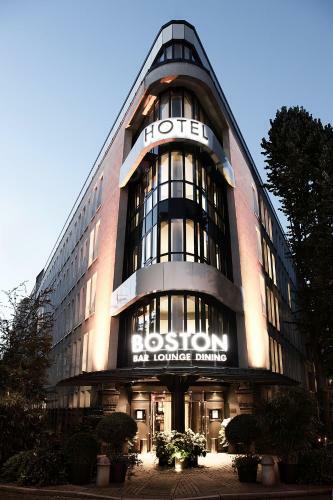 The modern rooms and suites of the BOSTON HH hotel have a king-size bed and a modern bathroom. A flat-screen TV with satellite channels, a minibar and a safe are also provided. Each guest receives a free bottle of mineral water. Use of the business corner is also free. A rich buffet breakfast with organic options is available each morning. The BOSTON's restaurant serves international cuisine for lunch and dinner. The stylish BOSTON Lounge offers a variety of snacks and drinks. It features armchairs, a fireplace and a library. Stylish room featuring satellite TV, a seating area and a minibar. Toiletries and a hairdryer are provided in the en suite bathroom. Stylish room featuring satellite TV, a seating area and a minibar. Toiletries and a hairdryer are provided in the en suite bathroom. These rooms are furnished in a Classic or Design style. They include a seating area. Stylish room featuring satellite TV, a seating area and a minibar. Toiletries and a hairdryer are provided in the en suite bathroom. Includes a spacious seating area and a designer bathroom with spa shower. Stylish room featuring satellite TV, a seating area and a minibar. Toiletries and a hairdryer are provided in the en suite bathroom. Spacious suite with a living area and designer bathroom with spa shower. Stylish room featuring satellite TV, a seating area and a minibar. Toiletries and a hairdryer are provided in the en suite bathroom. This extra spacious room offers 2 extra beds.